Groot seems like he’d be a pretty good friend to have. He’ll always have your back in a fight, he can inexplicably summon fireflies out of thin air when your movie needs more 3D effects, and he’s one helluva dancer to boot. He’s also a pretty good texter, it turns out. At the very least, he’s consistent. Want to see for yourself? 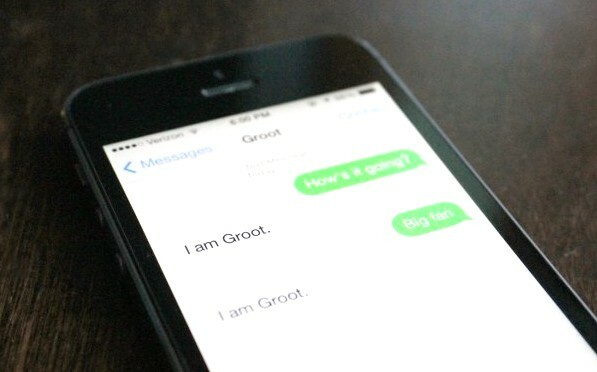 Here’s Groot’s phone number: (866) 740-4531. Shoot him a text and prepare yourself for some of the deepest conversations you’ve ever had. Save it to your address book and blow your friends’ minds (or, at the very least, mildly amuse them for 10 seconds) next time you’re at the bar.